*Menu options might be limited on busy times. We suggest pounded yam with a pinch of soy sauce on the unagi. 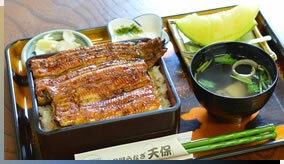 Unagi Ju (regular) 3,300 yen is also available. 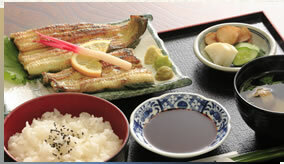 The whole eel is grilled thoroughly seasoned with sake and mirin (cooking rice wine) Try the plain taste of the eel by adding lemon, wasabi and the ginger soy sauce. 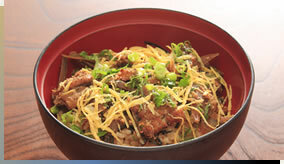 With pickled vegetables and eel liver soup You can try spicy yuzu kosho (yuzu flavored chili condiment) for seasoning. Shirayaki Teishoku (regular) 3,000 yen is also available. The eel, green onion and green pepper are perfectly browned. With pickled vegetables and clear soup with eel liver. You can try spicy yuzu kosho (yuzu flavored chili condiment) for seasoning. 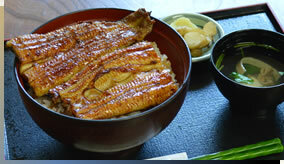 The eel and burdock root are simmered in sweetened soy sauce and mixed to the rice. With siso basil, shredded eggs and sesame flavor. It's a local cuisine, a secret meal from the farming staff A gorgeous dish to be gobbled down! With pickled vegetables and clear soup with eel liver. Half Don is popular between women and the elderly. This best deal bowl dish is serves a half giant eel. Early order is appreciated as serving is limited to 5 couples (10 dishes) per day. We are sorry if they are sold out. *We refrain from selling alcohol beverages to the drivers.